Lotte Pedersen, a day-care manager in her home town of Skive in Denmark, traveled to Kenya with her 6-year-old daughter Olivia to volunteer at the Care project. Both Lotte and her daughter Olivia were placed at Hope Children’s Ministry, where the family’s presence has been a great addition to the center. Lotte and Olivia effortlessly slotted into the daily activities, because of Lotte’s previous experience working with children and Olivia’s charming exuberance. 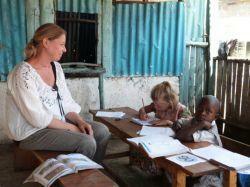 Despite not being able to speak English, Olivia was still enthusiastic about learning Swahili games and songs. The 6-year-old also provided a helping hand to her mum in the classroom where she taught her Kenyan friends Danish folk songs. Like her daughter, Lotte has also brought some change at Hope Children’s Ministry. Lotte helped set up an extra class for the students that have already completed all the levels provided at the Ministry and the new structure will provide more motivation for the students to graduate. The set up includes all the necessary structures to ensure that future volunteers and the local teachers are able to easily run the class. This mother-daughter team has not only been an inspiration to the children and staff of Hope Children’s Ministry, but also to future volunteers who would like to volunteer as a family.